Graves has some new company. Deadline reports It’s Always Sunny star Joanna Sanchez has joined season two of the EPIX TV show. 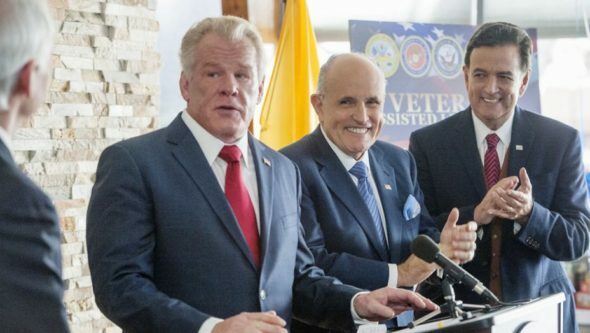 The dramedy stars Nick Nolte as a former U.S. president who embarks on a Don Quixote-like quest to right the wrongs of his administration and reclaim his legacy. The cast also includes Skylar Astin, Heléne Yorke, Chris Lowell, Callie Hernandez, Nia Vardalos, Ernie Hudson, Roger Bart, and Angélica Maria. In season two, Sanchez will recur as “Julia Martinez, the Graves’ new housekeeper, with a dry sense of humor and “been there, done that” attitude.” She joins fellow new Graves castmembers Spencer Grammer and Adam Goldberg. The new season of Graves began production a few weeks ago. EPIX has not yet set a premiere date. What do you think? Have you seen Graves? Will you watch season two? WHEN DOES IT COME BACK! I AM ABSOLUTELY JONESING FOR MORE ‘GRAVES’!!!!!!!!!!!! I love it! It is a great show. I have been very impatiently waiting for season 2. I was an extra in episode ten of season two, so I definitely want to see what happens!